The National Football League and Major League Basketball will be present at Pride for the first time later this month. They will join the NHL, NBA and WNBA, who have all been registered to march in the parade and have floats, with Major League Soccer and the National Women’s Hockey League having employees marching also. Outsports reports that former NFL star Ryan O’Callaghan will feature on his league’s float after publicly coming out last year, and will be joined by Wade Davis who works closely with the NFL to aid LGBTQ inclusion. And MLB will have a huge presence, bringing along 200 employees which includes gay former umpire Dale Scott and executive and former player Billy Bean. Former tennis world number one Billie Jean King has been named as one of the Grand Marshals at the Manhattan event which will take place on June 24. 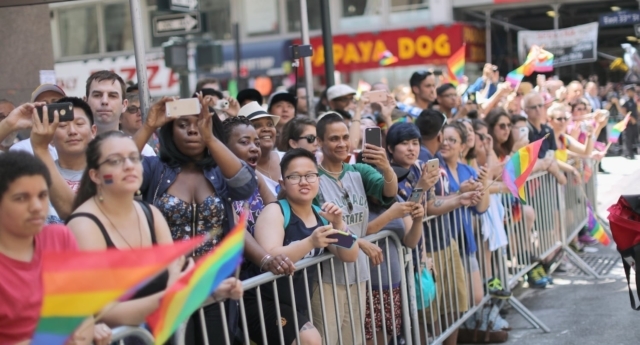 NYC Pride has already been targeted by anti-LGBTQ activists who have labelled the day a “celebration of paedophilia” for putting a 10-year-old in drag at the forefront of the campaign. Desmond Napoles, known better as Desmond is Amazing, is part of the ‘Defiantly Different’ 2018 Pride campaign. “I am very young and doing drag at a very young age. “It makes me feel amazing. It gives me courage and also gives other people courage to do what they want,” he says in the ad. But anti-LGBT activists have targeted Pride over Desmond’s love for drag and confidence in performing. Michelle Cretella, president of the anti-LGBT conservative lobbying group the American College of Paediatricians, has said that the Pride event would be a “celebration of paedophilia” if it allows young children to perform. “Our culture is morally blind and has suppressed the scientific facts about homosexuality and transgenderism,” she told CBN. Speaking to PinkNews, the Media Director of NYC Pride, James Fallarino, said: “Desmond is a great kid with a great family that supports him. He’s a role model for his peers, and he is the embodiment of our ‘Defiantly Different’ theme this year. “I think it’s pretty low for anyone to attack a 10-year-old, but considering these are the same people who believe hurricanes are God’s punishment for homosexuality, this isn’t entirely surprising. “They don’t exactly have a track record of respect for anyone who doesn’t fit their radically narrow worldview.